sewing guide: bamboo jersey more from back in stock! Wonderfully soft and drapey, this bamboo viscose/organic cotton/spandex 4-way stretch jersey is a lovely, lightweight knit that is eco-friendly and made with organic fibers and non-toxic dyes. It is opaque with a matte finish, and 30% widthwise, 20% lengthwise stretch. 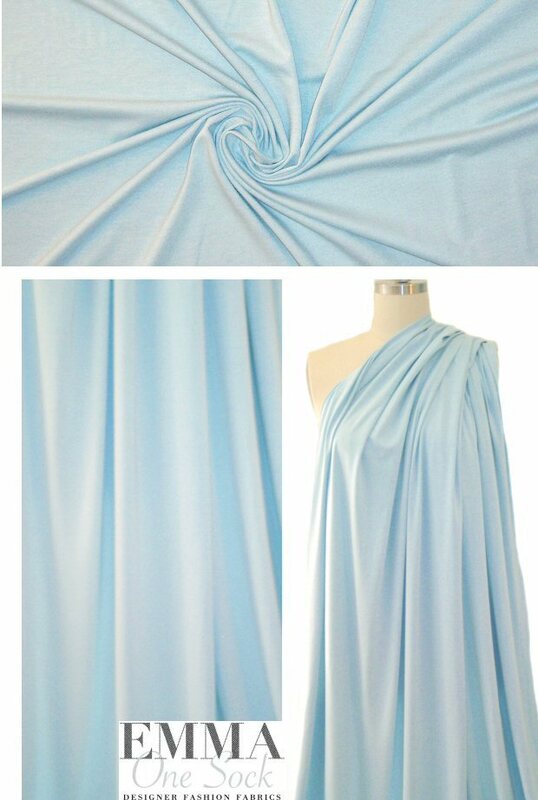 Perfect for trendy tees, tops, tunics, loungewear, baby and kids clothing, yogawear, and the color is a pretty sterling blue tone (PANTONE 15-4309). Eco-friendly and sustainable. Machine wash, cold water with like colors, and tumble dry low. No bleach.